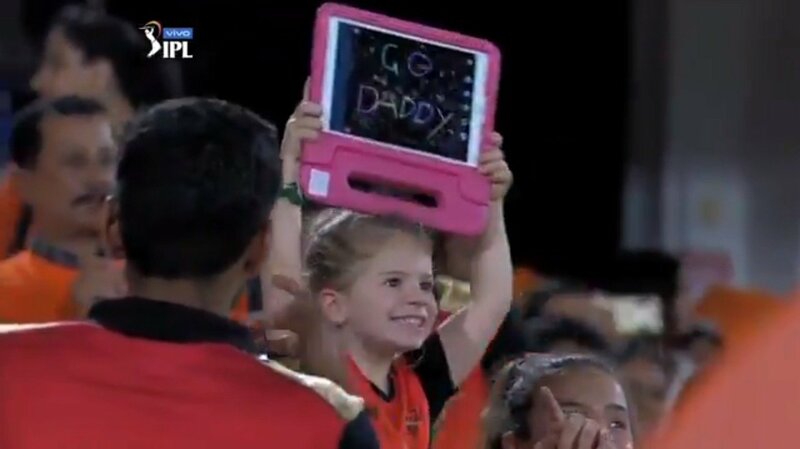 David Warner’s daughter Ivy rooting for her dad from the stands at Rajiv Gandhi International Stadium is the best thing you will see on the internet today. She was jumping in the stands as she held a placard which read, “Go, Daddy”. Warner’s daughter was doing it with a lot of innocence and heart which got fans all excited. She was shown on the big screen, Warner saw that while SRH was in a huddle after the toss, Rashid Khan and some other teammates smiled when it happened to make it a cute episode. Meanwhile, Chennai Super Kings (CSK) stand-in skipper Suresh Raina won the toss and opted to bat against Sunrisers Hyderabad (SRH). CSK’s regular skipper Mahendra Singh Dhoni was forced to miss the match with a back injury. The visitors have made two changes to their playing XI with Dhoni and Mitchell Santner being replaced by Sam Billings and Karn Sharma. On the other hand for SRH, Yusuf Pathan and Shahbaz Nadeem have come in Abhishek Sharma and Ricky Bhui in the playing XI.